Those seeking an unparalleled escape should look no further than the Villa Antigone. In a secluded position above Agrari, one of the finest beaches in all of Mykonos, Antigone offers stunning sea views and total privacy, in a setting of utter tranquility. 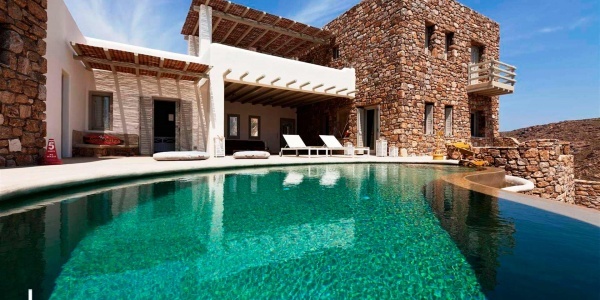 This beautiful stone property and it’s expansive grounds, along with it’s sister-villa, Cleopatra, are known for their unique design, perfectly appointed interiors and desirable location. If wished, they can be rented together for large groups, whilst still retaining exclusivity from one another. With a private path leading down to the beach, just a five minute walk away this villa benefits from beautiful, peaceful surroundings, that can’t fail to capture the heart of any visitor. The Villa’s stylish interior artfully combines minimal architecture with provincial, “beach house” elements, and all expected modern comforts. The property comes equipped with an open-plan kitchen and modern appliances, allowing guests to unwind in total contentment. However, it’s unlikely you’ll be inside long, as the stylish outdoor dining area and woodfired BBQ are perfect for soaking up the sea air and warm Mykonian nights. Whether you’re taking a dip in the infinity pool that sits, lagoon-like and inviting, at the front of the property, or relaxing in the shade of the adjacent pergola, the Villa Antigone offers a new type of holiday, one more fantasy than reality. There is 500m dirt road to access the villa. One guest studio with two double beds, A/C, en-suite bathroom, separate entrance. Parking area for 2 cars. Villa Antigone has a neighboring villa on the same plot which is villa Cleopatra. In a secluded position above Agrari, one of the finest beaches in all of Mykonos, Cleopatra offers stunning sea views and total privacy.